When we decided to plan our Indonesia trip, we were certain of one thing, we would do more than just Bali. Should we go west towards Borobudur or should we go east toward Flores? After a fair bit of research, we came to a conclusion, that we would want to go east. Why, you ask? Dragons! Yes, we are obsessed with Game of Thrones. Sadly these dragons don’t exist. But Komodo dragons do! Komodo dragons is a species of lizard, specifically the monitor lizard family, Varanidae. It is the largest and the heaviest lizards in the world. Also known as the Komodo monitor, their bite is venomous. This is a baby Komodo monitor. Full-grown adults (like the first picture) can reach as much as 10 feet. They are found on both Komodo Island and Rinca Island in Indonesia. And that’s where the conundrum happened. Should we choose Komodo or should we choose Rinca? Both these islands, though known for the dragons have much more to offer. The landscapes are breathtaking. There are various trails and hikes around the islands. The beaches here are pretty unique. The red coral fragments lend the colour to the sand due to which it is pink! If you haven’t read our September favourites post already, you can hop over and read about us raving about Komodo. 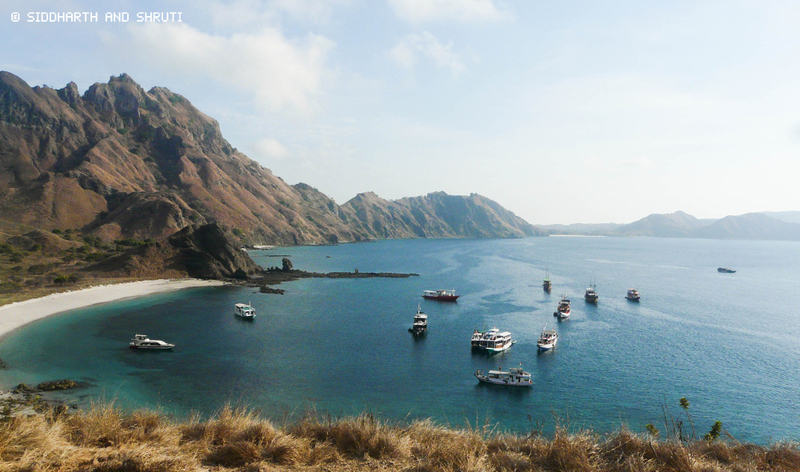 Our plan was to stay in Labuan Bajo and do a one day trip to either Komodo or Rinca. We wish we had more time (don’t we always?) to explore both. But unfortunately we had to pick one over the other. Since Rinca is closer to Labuan Bajo than Komodo, tours to Rinca are cheaper and you have an option of going for a half day one. The dragons on Rinca are said to be a bit smaller than the ones on Komodo. Since it was our anniversary trip, we decided to splurge and go on to Komodo, opting for a full day boat trip. Komodo National Park is located between Flores and Sumbawa Islands encompassing three major islands called Komodo, Rinca and Padar and a bunch of other smaller ones. They are all of volcanic origin. It was declared as a UNESCO World Heritage Site. The terrain is hot and dry with savannah vegetation. 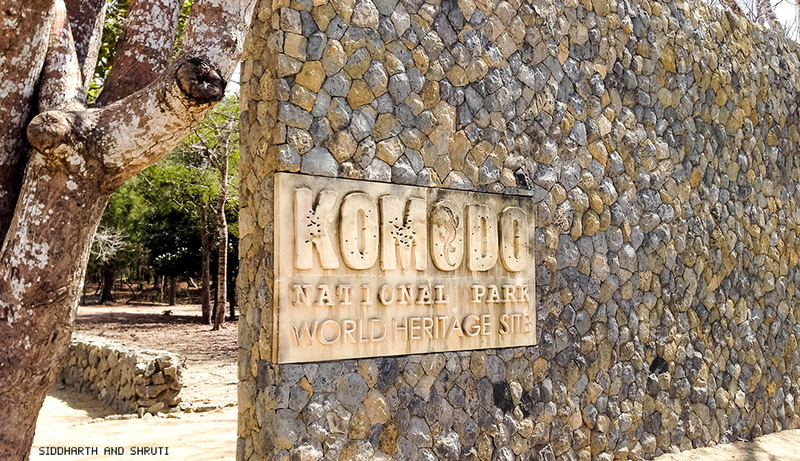 There are four trails inside the Komodo National Park, each of varying lengths. The longest one has the highest chances of spotting Komodos. They are more likely to be spotted at the water hole and the dragons nest. We did spot them at both. This trip is generally combined with a visit to Padar Island, which is a lovely trek and a couple of places on the minor islands for snorkelling. You can choose a combination based on what you want to see. These volcanic islands are gorgeous and have to be done with a local boat tour operator. As tempted as you may be to save money, a bad tour operator might ruin the trip for you. Make sure you read reviews for the one you pick before you commit to any money. 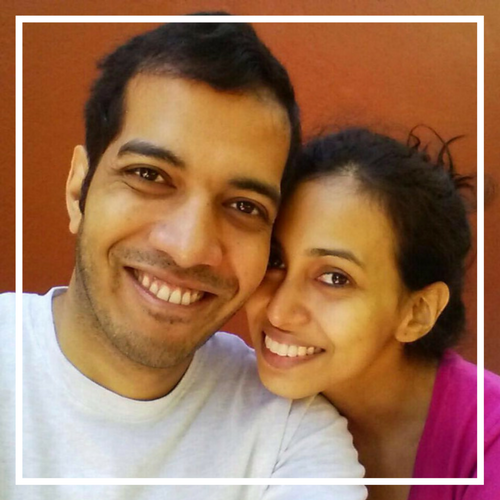 If a full day trip is not in your budget, opt for a half day trip. Komodos can smell blood. If you are on your period, you need to inform the park ranger who will then instruct that you walk alongside. The terrain is preserved in favour of the mighty Komodo and is quite dry. Carry a bottle of water and a hat. Based on the trail you choose, you might require to walk a little or a lot. Wear comfortable shoes and breathable clothes. 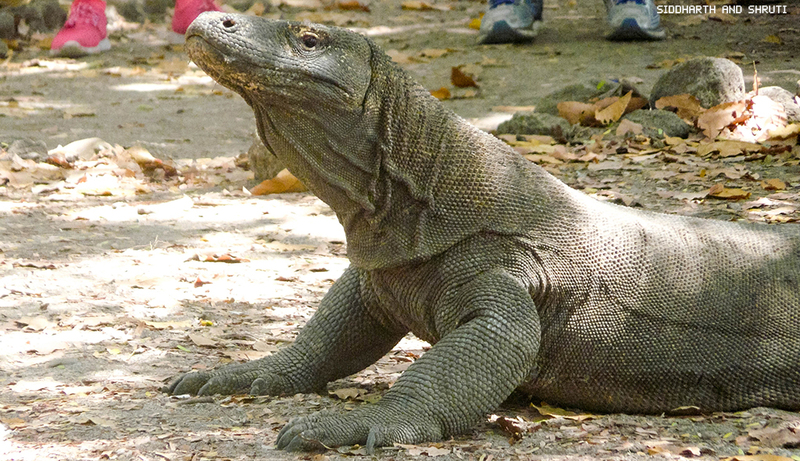 Mating season for the Komodo dragons begins between May and August. If you visit around September, you might see the eggs. 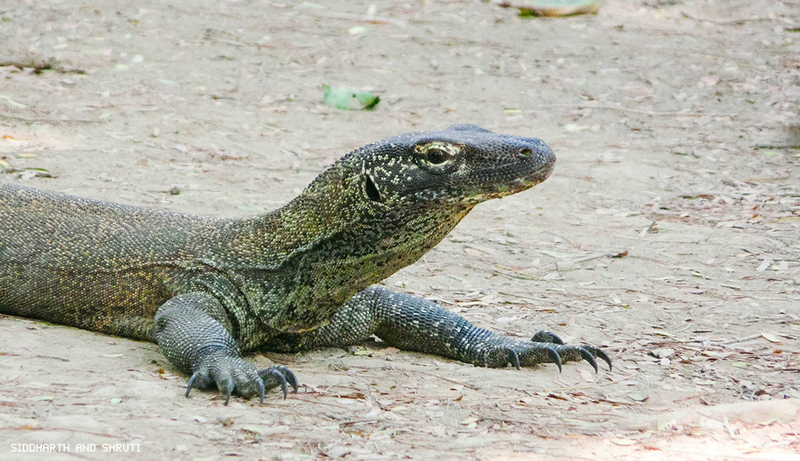 With a population of around 5,700 Komodo dragons, you do have a good chance of spotting them. Since they are in their natural habitat, there is always a possibility that you might not. We think that a disclaimer here is necessary to prepare you for what you might see. These creatures are not as aggressive as the ones in wild, since they do see visitors on a daily basis.This does disappoint some who think that they are going to encounter a wild Komodo in their natural habitat. There has been a situation or two where the dragon attacked, so do not provoke a wild beast however tame it may appear. Have you been to Komodo or Rinca? or both? Is it on your bucket list? Or something you would never do! Let us know in the comments below. Previous Post The mysterious Neelakurinji flowers that bloom once in 12 years are blooming in 2018! Hahah They only look slow. They are pretty deadly and fast. Now I really wish I went! I was just in Bali earlier this year, but due to finance, I couldn’t go to Komodo National Park. I’ve been long wanting to these beauties since I saw Steve Irwin was talking about it on his show when I was a kid. They can be dangerous but very, very fascinating. I prefer to see them in the wild like Steve Irwin had, but I know it was for safety reasons as there were some attacks before. I’m curious since you went there, did you avoided taking a selfie (at a very long, long distance of course) with them because you don’t think it’s right or was it just not allowed there? Because It’s far too common I’ve seen many people were taking selfies with them. In 2017, a Komodo bit a tourist who went too close and disturbed him while eating. We did ask the ranger to take an illusion shot of us which was more interesting than the selfies. But yes, safety first. Love the GoT intro, that made me giggle. And yes I can see that komodo dragons are the nearest real life version! Would be thrilling to see them in real life, thanks for the tip that Rinca ones are smaller than those on Komodo Island. It was! Imagine if a Komodo was named Drogon! Haha. Bali is on my bucket list so it is good to learn more about what else Indonesia has to offer. We have also seen monitors in Australia. I like the idea of combining the Komodo Dragon trip with a water activity like snorkeling. Wow what a fascinating visit! Gosh I would not like to tell a park ranger if I was on my period… but I guess safety first! Interesting that they are not as aggressive as they see visitors on a daily basis. I would love to do the long trail to have a high chance of spotting them! Wow, what an experience. I would love to see those magnificence reptiles in real life. This has to be one of the most unique national parks in the world. As close to a real-life “Jurassic Park” as we will get in our lifetime. 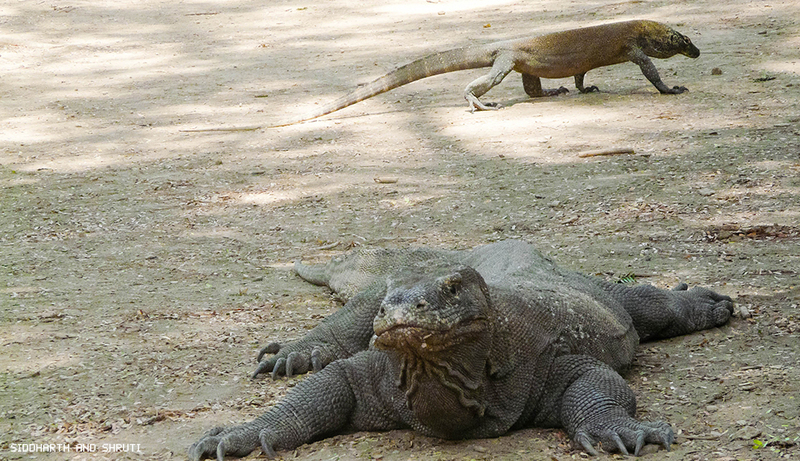 What an experience No other place has these dragons and it’s good they are now protected at the Komodo National Park. Great decision to go to Komodo than the other islands! Thanks. It was fun and we ticket off a bucket list item. Great photos! Komodo dragons are so cool. I decided not to try to fit this into a short-ish Indonesia trip last year (I ended up going toward Borobudur instead), and I don’t really regret it, but I’m dying to go back and see the dragons. 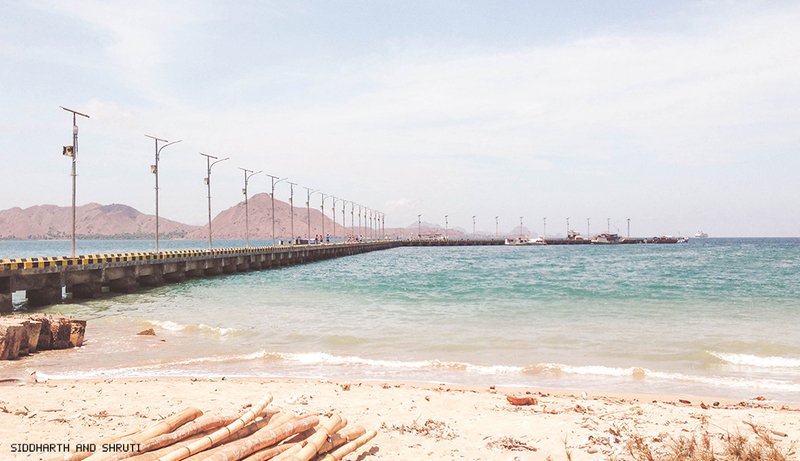 Did you fly all the way to Labuan Bajo just for one day? No, we stayed there for three days. Did you catch the sunrise at Borobudur? I would love to do this! Komodo Dragons were my favourite animal when I was a kid, very interesting about being on your period.. something very useful to note! Definitely on my list for indonesia. Very informative as well, will be saving this for next year! I love the light pink shade to the beaches! Seeing the Komodo dragons is such a dream of mine. They look so frightening , but also super cool. I didn’t know they can smell blood. I’ll definitely have to keep that in mind when I go. 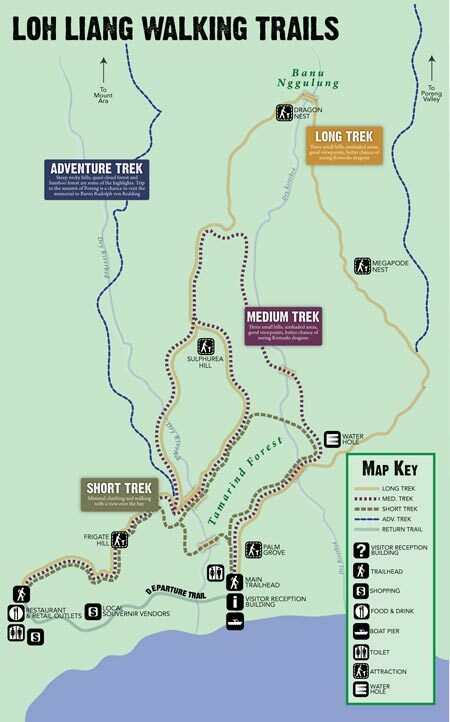 How long are each of the trail options? Going to Komodo is definitely on my bucket list. I want to see the dragons and I also hear that the scuba diving off of Komodo is really fantastic. I’ve always been fascinated by Komodos. They seem like remnants from the Jurassic age that refused to go extinct. But I also loved the sheer landscape of the shore that you have clicked! These things are huge! Scary that they are deadly and I never would have thought being on your period would put you in danger, that’s a public service announcement for sure! Such magnificent creatures. Just finished watching a David Attenborough Planet Earth episode (for the third time) filming Komodo Dragons hunting and killing and then eating a water buffalo — an animal 10x their size. Komodo Dragons are amazing predators and they are only appear docile and are by no means tame or used to humans to the point they are comfortable with humans and will ignore you. We are prey if they are hungry enough or you just are, well, not smart. So cool you were lucky enough to experience this!!! On my list for sure. This was just like us!! When planning our trip to indonesia we also knew that the dragons was something WE HAD TO DO!! Boy am I glad we did!! I love that others are visiting as well!! everyone knows indonesia for bali, but really the dragons are pretty awesome! Man, I’d love to see these in their natural habitat! I remember reading about them for the first time as a child and being absolutely blown away. Crazy about the blood. 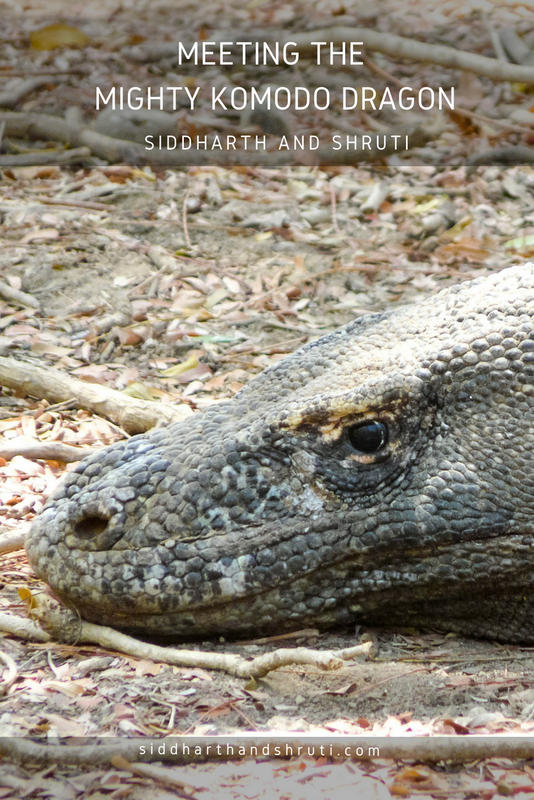 Komodo Dragons are such fascinating creatures and it is so great that you were able to see them in Indonesia. I went to Bali about 9years ago but didn’t know about this place but I wished I had because I would have gone. Glad to hear they are not as aggressive as the ones in the wild. Yes! Do visit Flores, not just for Komodo but also Padar islands and the pink sand beach. Bali is more developed. Flores is quite an untouched beauty. What magnificent beasts! I note what you say about them only looking slow, as I can’t imagine trying to outpace one if it was really determined. I can entirely see why this would be on your wishlist – after all, dragons! It sounds like a brilliant trip, and one I’d absolutely love to do. The pink beach sounds wonderful too. 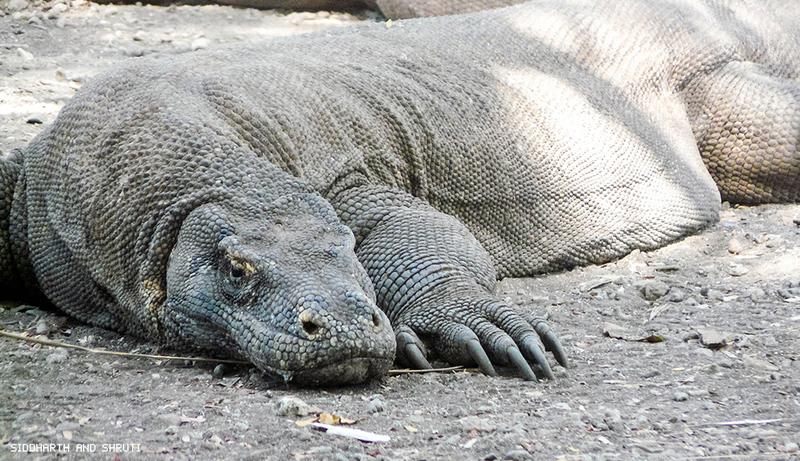 I’d love to see a Komodo dragon and would not want to visit while I was on my period. First, because I’d have tell the park ranger and second because I’d be chaperoned through the park. That being said, I totally understand and wouldn’t want to have a bad encounter with a Komodo either. The photo of the Komodo splayed out on his belly cracks me up! I’ll admit, the look of this creature scares me beyond belief! I don’t love reptiles, ha. But what a cool experience! First of all, you have a very good writing style. Man this is so cool, for me, it’s a fantasy to see them but I am a little afraid because according to some reports they assault humans, what’s your opinion.